Owning fine art is a priceless pleasure. 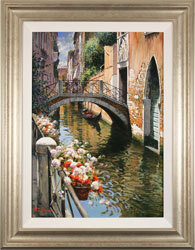 But nonetheless, budget remains a practical factor to consider when adding to a fine art collection. The gallery’s set aside service allows a client to spread the cost of a purchase over a series of flexible, interest free payments that suit his or her budget. The amount and frequency of the payments is decided by the client, and can be made in person, over the phone or by setting up a standing order. It is also worth noting that there is no minimum or maximum purchase limitation on eligibility for the service. Once the artwork has been secured with an initial deposit, the piece is safely stored with full insurance on the gallery premises. Collection or delivery of the artwork can then be arranged once the remaining balance has been paid in full. To find out more about the set aside service or to purchase artwork using this method, please telephone either our York gallery on 01904 634221 or our Harrogate gallery on 01423 561228.